I read a great article in the August 2013 Ensign last night, and had to share it with all of you. Now, before I begin I want you to know that just because I said I was reading the Ensign last night does NOT mean that I am this super awesome lady that reads the Ensign every month, studies her scriptures every single day, writes in her journal every evening before bed….you see where I’m going with this. Actually…what I read in the Ensign was just what I needed to read. I have noticed that lately, while feeding our new baby girl, I will have my phone and begin looking at Facebook, Pinterest, internet, etc. Yesterday I really noticed how much time I was spending on my phone. Why do I spend so much time looking at Facebook or Pinterest when I could be reading my scriptures or the Ensign (which is also on my phone). As I thought about that last night, I decided to stay away from the worldly medias and take some time reading something that would uplift me. And guess what I just happened to read about? As I read this I knew I was suffering from a Poor Digital Diet. I decided to make myself a little printable to keep on my mirror or in my new Mom planner to remind me to keep a well-balanced ‘media’ diet. With so many things out there distracting us it’s sometimes hard to stay focused. But we just gotta keep trying. I wanted to share my little handout/reminder with all of you, just in case some of you are suffering from a Poor Digital Diet. 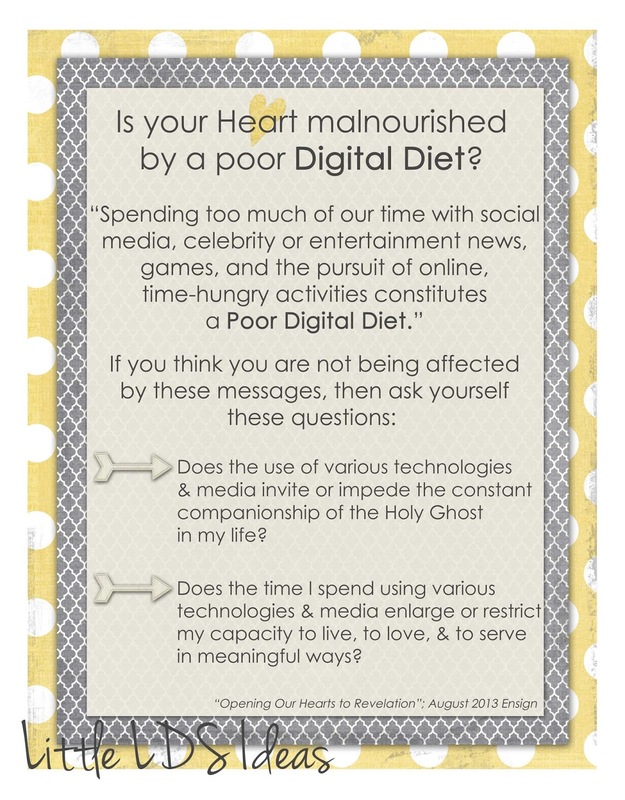 Click Here to print my Digital Diet handout. What do you do or what helps you keep a well-balanced ‘Digital Diet’? I would love to hear, so leave me a comment. That is just what I needed to hear too! Thanks for sharing!! That’s exactly what I needed to hear! Thank you so much!! :-D! I have a baby girl too & have been feeling the exact same way. I have a baby girl too & have been feeling the exact same way.